Spouses and children of politicians are off-limits. That has long been one of the rules in politics. Which is why Gov. Andrew Cuomo's recent swipe at Mayor Bill de Blasio's wife, city first lady Chirlane McCray, was somewhat unexpected. Appearing on WNYC's "Brian Lehrer Show" earlier this week, Cuomo took issue with McCray's statement that universal pre-K is the "defining civil rights issue of our day." Without mentioning her by name, Cuomo said: "You want to talk about civil rights issues of our day, the failing public education system, I think, is the civil rights issue of our day." Cuomo's remarks came just days after McCray told a gathering in Harlem that she is "not ready to settle for crumbs or table scraps or Band-Aids. I'm ready to fight." 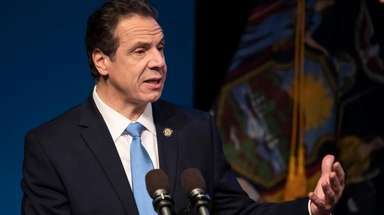 Cuomo was apparently not pleased with her suggestion that his proposal to pay for universal pre-K with existing funds rather than support a dedicated tax increase on the wealthy amounts to "crumbs or table scraps or Band-Aid." While politicians would normally face some backlash for taking on a political rival's spouse, that hasn't happened in this instance for two reasons. First, Cuomo was careful not to mention McCray by name (he didn't have to -- it's clear to whom he was responding). More important, Cuomo's jab was not directed just at the mayor's wife, but at McCray in her role as one of his key advisers and political partners. McCray's activism during these first few months of the administration should not be a surprise. De Blasio has repeatedly said they are "a two-for-one deal." And he has been true to his word. Just two months into the administration, McCray already has taken a leading role: pressing for universal pre-K, pushing for after-school programs, speaking for immigration reform, and serving as chairwoman of the Mayor's Fund to Advance New York. McCray has shown she will likely become the most active and activist first lady in NYC history. This is why Cuomo's muted attack is not surprising and why he hasn't received much criticism as a result. If McCray wades into the policy arena, we are likely to hear more of the same -- not only from Cuomo, but from other critics of the administration, too.